With all twelve sessions of round-robin play concluded on Thursday afternoon, the line-up for the Page Play-offs in the men's section of the World Junior Curling Championships in Sochi, Russia has now emerged. Scotland beat the USA by 8-3 in eight ends in this session to record their eighth win from nine games. That means that they top the rankings with a clear one win advantage over Canada, who beat China, also by 8-3 in eight ends, and Russia, who remarkably, also won by 8-3 in eight ends, defeating Norway. Because Canada beat Russia earlier in the round-robin, they rank second overall and now go on to face Scotland in Friday evening's Page 1 v 2 Play-off, with the winner going direct to Sunday's gold medal final, and the loser having a second chance by way of Saturday's sole semi-final. the semi-final. The loser of that game will come back onto the ice to play against the semi-final loser for bronze on Sunday. Sweden had concluded their round-robin programme last night and finished with a won six, lost three record in fourth. Norway, on five wins, finished fifth to just miss out on a Play-off slot. After these games, Scottish skip, Kyle Smith, was quietly pleased. "That was alright," he said, "We just did what we had to do to put another win on the board, and we're now exactly where we wanted to be at the start of the week." Looking forward he added: "We're just going to keep doing what we're doing." 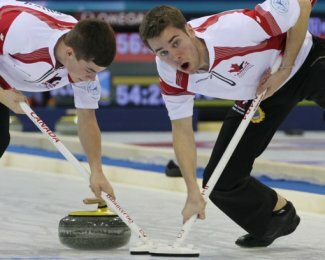 Canada's skip, Matt Dunstone, reflected on his win over China, saying: "We just started to play a little more of our game. We knew once we got a lead on them, they'd call some shots that weren't totally correct and we'd have our chances on them. Earlier on they were making everything so we had to bear down and have patience in that one." Reviewing his campaign, and especially his opening day 5-4 win over Russia, he said: "That win against Russia was huge. Earlier in the week you might not think that and think it's just another game but looking at it now, it's a huge win for us. Now we're looking forward to the 1-2 game against Scotland." Meanwhile Russian team coach, Vasily Gudin, reckons his team have made a little bit of history. "This is the first time in Russian history the junior men's team made the play-offs, I think," he said, adding: "I feel happy, absolutely happy. It's incredible". Looking forward he said: "We don't care which team we play against, it doesn't matter. What does matter is execution through the whole tournament." In the fourth game of the final session, Italy beat Switzerland by 9-6 in an extra end. That means that they rank sixth, on the same won 5, lost 4 record as Norway, but below the Norwegians because they lost the head-to-head between the two. Session 12: Switzerland 6, Italy 9; Norway 3, Russia 8; USA 3, Scotland 8; China 3, Canada 8. Curling fans around the world will be able to follow live coverage of the event on the event website http://wjcc2013.worldcurling.net and the World Curling Federation’s YouTube Channel World Curling TV. The World Junior Curling Championships 2014 will take place in Flims, Switzerland, from 26 February to 5 March 2014 in the Waldhaus Curling Arena.